For propanone, it lies almost entirely on the left, whereas for the hexafluoro derivative it is almost entirely on the right. The standard answer to this is that electron-withdrawing substituents destabilize the carbonyl compound more than the hydrate. But could there be more to it than that? Might the converse also be true, that electron-withdrawing substituents stabilise the hydrate more than the carbonyl compound? To answer this last question, consider the anomeric interactions possible in the diol. There is the standard anomeric effect operating between the two hydroxy groups, whereby a lone pair donor on one oxygen interacts with the C-O acceptor bond of the other oxygen, and vice versa, a total of two stabilising interactions. But what if the C-CF3 group could also act as an acceptor instead of the C-O? That would give the trifluoromethyl system a total of four anomeric interactions, each of them stabilising, compared to only two for the methyl system. Garnering evidence, firstly we compute (ωB97XD/6-311G(d,p) ) the free energy difference for the two equilibria above. These turn out to be +3.3 kcal/mol for the top equilibrium, and -9.0 kcal/mol for the bottom, which agrees with the assertions made earlier. The computed geometry looks as below. Geometry of hydrate. Click for 3D. 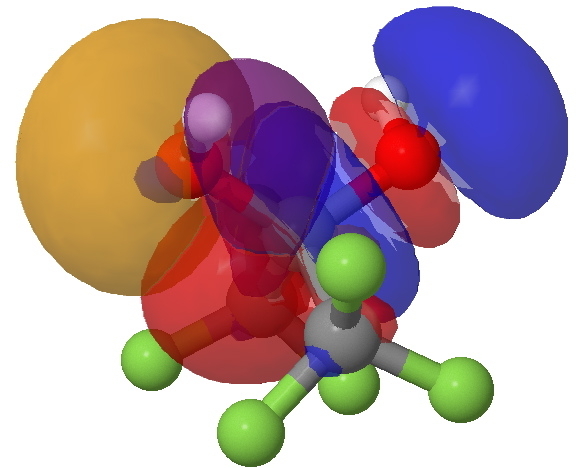 We must now go hunting for anomeric interactions, and this is done using an NBO analysis. We look for large interactions between a donor (a lone pair on either oxygen) and an acceptor (which is conventionally the C-O anti-bonding NBO, but can now also be the C-CF3 anti-bonding NBO). Indeed exactly four large interactions are found, in pairs of E(2) = 17.5 and 9.8 kcal/mol. The former is common to both the systems above, but the latter is larger for the trifluoromethyl substituted equilibrium than the methyl system (for which E(2) is 6.2 kcal/mol), and therefore constitutes additional stabilisation by the electron-withdrawing groups of the diol. Each oxygen has two lone pair NBO orbitals. The initial hypothesis is surely that it uses one of these to align with a C-O anti bonding acceptor, and the other to align with the C-CF3 anti bonding acceptor. The first of these is shown below. The interaction between an O(Lp) and a O-C BD* orbital. Click for 3D. The colour code is that the two phases of the oxygen lone pair (Lp) are shown as purple/orange. These are superimposed upon the C-O anti bonding NBO (referred to as BD* in the output), which has the colours red and blue. I advise you now to click on the graphic above to load the 3D model and the orbital surfaces. 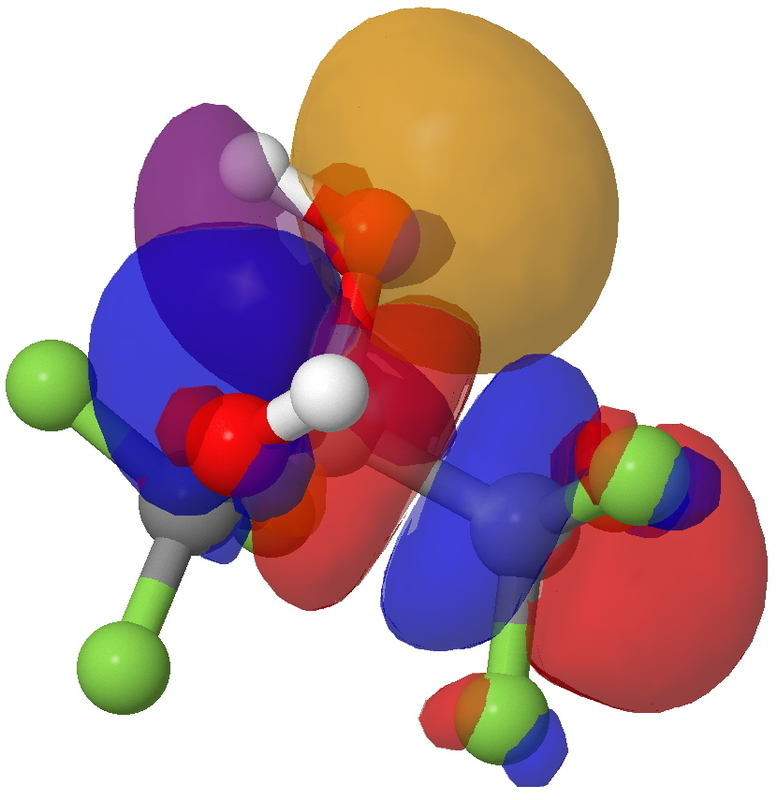 You should spot the node along the C-O bond with a blue-red boundary. You will also spot that the orange phase of the Lp overlapping with the red phase of the C-O BD*. This is defined as a positive (stabilizing) overlap. Likewise the purple phase of the Lp overlaps with the blue phase of the C-O BD*. In other words orange=red, and purple=blue. I have made orange and red, and purple and blue deliberately different so that the origins of each NBO can be spotted. This combination therefore has good overlap, and this gives rise to the large E(2) interaction energy of 17.5 kcal/mol. Now for the interaction with the C-CF3 BD*, the one with E(2) = 9.8 kcal/mol. The interaction between an O(Lp) and a C-CF3 BD* orbital. Click for 3D. 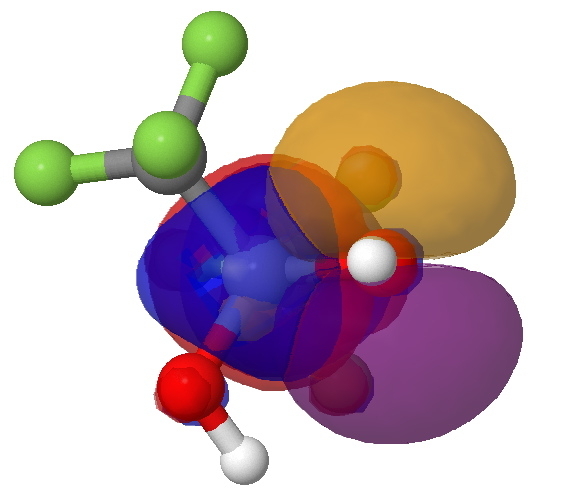 You can see the blue-red node along the C-CF3 bond quite clearly. But hang on, the O Lp orbital is the same as before! It is overlapping with BOTH the C-O and the C-CF3 BD* orbitals. 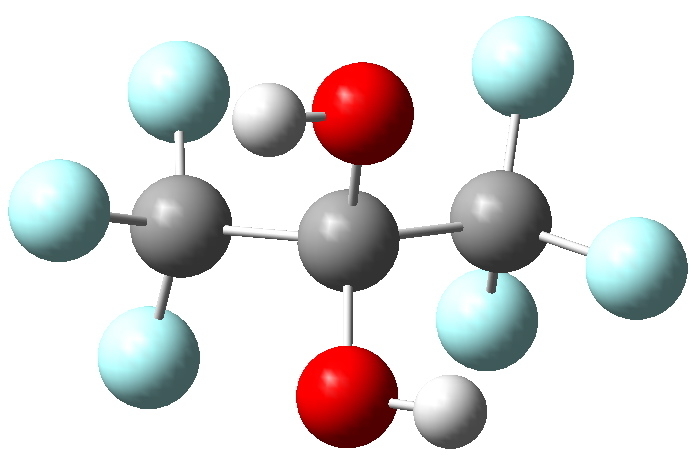 The other O Lp is shown below (viewed along the axis of the C-CF3 bond). 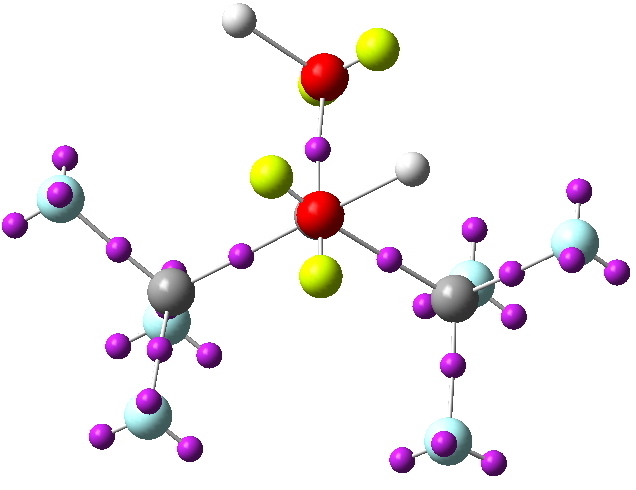 Note how an equal proportion of the orange phase and the other purple phase of the O Lp overlap equally with the blue phase of the C-CF3 bond. In other words, one cancels the other. The interaction between the other O(Lp) and a C-CF3 BD* orbital. Click for 3D. So we have found that just one (of the two lone pairs) on each oxygen overlaps with both the C-O and the C-CF3 anti bonding NBOs, the latter giving a stabilisation not present when the group is instead C-CH3. We can attribute this to the far greater acceptor properties of the C-CF3 BD* because of the electronegative character of the fluorines. This is an anomeric effect with a difference. The CF3 group is not normally associated with inducing such an effect (just as the CN group is not, see this post or this post where an alkene acts the donor instead of a lone pair). Also unusual (more accurately, I have not encountered it before) is the (apparent) use of the SAME donor lone pair to induce TWO quite different anomeric interactions. Before getting too excited by this unexpected effect, it it is worth taking a look at another technique for analysing lone pairs. The ELF (electron localisation function) can provide the centroid of what is referred to as a monosynaptic basin (a lone pair in other words). EKF function, showing O Lone pairs (in yellow). Click for 3D. You can see in yellow the oxygen lone pairs. Note how one of them aligns with the C-O bond, and the other with the C-CF3 bond. Unfortunately, the ELF method does not allow the strength of the interaction to be quantified, which is why the NBO analysis is preferred. So we can conclude that not only might electron-withdrawing substituents destabilize the carbonyl compound more than the hydrate, but they certainly also stabilise the hydrate more than the carbonyl compound. This entry was posted on Friday, March 9th, 2012 at 3:15 pm and is filed under Interesting chemistry. You can follow any responses to this entry through the RSS 2.0 feed. You can leave a response, or trackback from your own site. So what would you predict for the hydration of the perfluorinated ketone F5C2-C(O)-CF(CF3)2 ? Intuitively, I would have thought it should be hydrated to 100%. However, the answer is: it is not hydrated at all, and not soluble in water. The compound is a non-toxic liquid used for extinguishing fire (brand name: Novec-1230). Would you say the non-hydration might be due to steric effects or lack of a proper hydration shell, as for acetone in your more recent post? Spotting the unexpected. The trifluoromeric effect in the hydration of the carbonyl group. is licensed by Henry Rzepa under a Creative Commons Attribution-Noncommercial-Share Alike 3.0 United States License.